That voice. That smell. I know both of those! Do you know how happy it makes a cat when my real owner comes home? Technically, Bitsy Cummings is the one who brought me home. But I want my human to be Sophia. I heard the pots and pans rattling around in the kitchen, I knew it wasn’t Bitsy because she never cooks. I stayed in my hiding spot until I heard the ding of the oven, then waited to see if my hopes were coming true. Then. . . I darted downstairs into the kitchen after I smelled the warm buttery and cinnamon that drifted upstairs because I knew it was Sophia. I wasn’t going to leave her side. I even had a plan to hide in her suitcase, so she could take me back, only she emptied the suitcase. This sent my cat instincts into high alert, that and the crying about her heart being broken. This meant I wasn’t going to leave her side. If that mean clawing Bitsy, I would. But my role has changed with Sophia. Now she’s got some crazy idea that she’s going to bake herself up into solving a murder mystery. This means I better sharpen my claws incase she’s in danger. You can read more about Duchess and her adventures in the brand new Southern Baker Series, CAKE AND PUNISHMENT. Maymee Bell is the pen name of USA Today Bestselling author Tonya Kappes. She lives in Kentucky with her family and her two schnauzers. 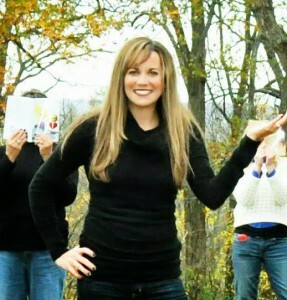 She likes strong coffee, slow-country days, and fresh-baked cookies – but she like telling stores best of all. This is her first SOUTHERN BAKER MYSTERY. 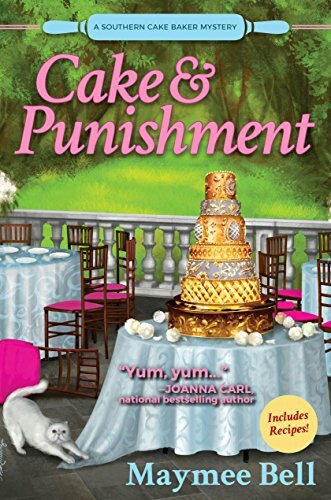 Review (5 Stars): Cake and Punishment was a delightfully delicious mystery and I absolutely adored Sophia from the very first page. This mystery is well-written and fun and I wanted to jump in to have a bite of Sophia’s amazing creations. Cake and Punishment is the first book in a brand new series and I’m already a fan of her family. I can’t wait to see what is next on the menu for Sophia and see what kind of trouble she finds herself in during book number two.